Posted by Ray Poynter, 30 January, 2019. 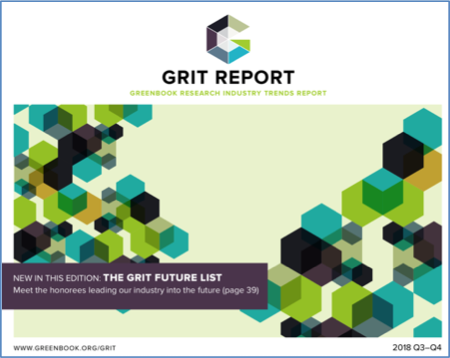 The GRIT report is published twice a year by GreenBook and Lenny Murphy and provides a snapshot of many of the latest trends from the Market Research and Insights Industry. The great things about the GRIT study are its sample size, the substantial number of end clients who take part, and its topicality. Its key drawback is that it is not a representative sample of the industry, so it needs to be read in the context of earlier reports and in the context of people who are highly engaged with changes taking place in the industry. The full report is well worth reading, and you can download and read the GRIT report for free from the GreenBook site. But here are the seven things that I think you really need to know from the latest report, published this month, based on 1260 interviews (931 suppliers and 329 buyers of research) collected in Quarter 4 of 2018. Agile and Automation have been major themes of the last few GRIT reports and AI is now an equally big theme. These As are happening, they are embedded in products and services being delivered; they are changing the way companies are doing business; they are making things faster and cheaper. They are most powerful when they are used in combinations. In the section of the report that looks at Game Changers, Automation and AI are two of the strongest themes (along with Big Data and Storytelling). When you hear these As, don’t just roll your eyes, yes they are buzzwords, but they are also real. The most widely used newish technologies are things like online communities, mobile surveys & mobile qual, text analytics, big data and social media. The most innovative approaches, e.g. biometrics, wearables, internet of things, all remain niche – they are not delivering faster/cheaper research at scale. One concerning pattern in the emerging technologies section is that it is clear that many clients are buying their big data analytics and social media research from non-MR companies. In emerging technologies and elsewhere we see some of the strongest growth and the greatest interest being in qual, rather than in quant tech or just numbers. Add this together with the focus on storytelling (something which is greatly aided by qual) and it is clear that 2019 and the next few years should provide great opportunities for qualitative research to integrate further with the need to provide solutions. The industry figures from ESOMAR put qual at about 15% of the industry and quant at 85%. But amongst the GRIT community (which we believe to be an indicator of where things are going) the split between Qual and Quant is 35% to 65%. Clients tend to rate agencies well on their ability to conduct research (fieldwork, survey design etc). But they tend to rate agencies badly in terms of understanding business, making recommendations, and the lack of good data visualisation. The lowest score was for the relationship between the value and the cost – which undoubtedly relates to the value of the outputs produced by research. The cost of research is determined by the work undertaken, but the value of the research is determined by the impact the results have. 5) Suppliers are Focusing on the Wrong Thing! If we can believe the responses to the GRIT survey, suppliers say that when they are choosing a method they overwhelmingly focus on the quality of the insights, followed (at some considerable distance) by Speed, Price, Ease of Synthesis with other Sources, and Scalability. I would suggest that in most cases Price, Speed, Scale and the ability to combine the results with other sources frame the project, once those have been agreed, then the best solution that meets these criteria can be selected. Agency preferences seem to be: first choose the best solution and then see if you can shoehorn it into the available time, budget, and context. One of the best elements of GRIT reports are the commentaries, which can really bring the data alive and draw of the experiences of people who are making an impact on our industry. I would draw attention to the contributions from Zach Simmons (Founder and CEO of Discuss.io) and Stephen Phillips (CEO of ZappiStore) both of whom focus on scalability. Your agile, AI-wielding Automation will make little impact on the industry if it can’t be scaled. Indeed, this is why things like biometrics and wearables are struggling at the bottom end of the table in the Emerging Technologies section. In terms of forecasts about spending, revenue, headcount and overall optimism, the responses in GRIT tend to be high. However, my personal view is that this reflects the sort of people we have interviewed (go-getting, entrepreneurial, new tool trying sort of people). The 2019 economy is likely to be bad, so I would suggest really focusing on the concerns from those people who had negative comments to make, such as “Our department has been reduced headcount-wise so we don’t have the resources to produce as much research. ” and “Short term economic forces impacting the entire organization has placed tremendous pressure on all departments to become leaner and more agile. ” By all means, plan for growth, but have a Plan B. So, please do download and read the report. If you have read the report, how does my summary seem to you? What would you add, delete, or change?